Interview with Nattali Rize - Rebel on the Rize! Rebel on the Rize! 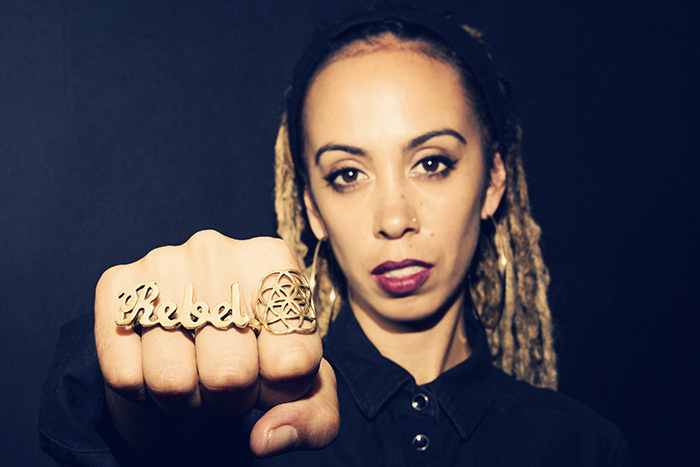 With her album Rebel Frequency, the Australian artist with Mexican and Samoan roots continues her mission of waking and shaking and spreading conscious messages. Born out of a collaboration with Kingston-based Notis Music and French Baco Records, it gives us a deep insight into the creative potential of Nattali Rize, bringing together some of the best contemporary Reggae artists outta Jamaica. 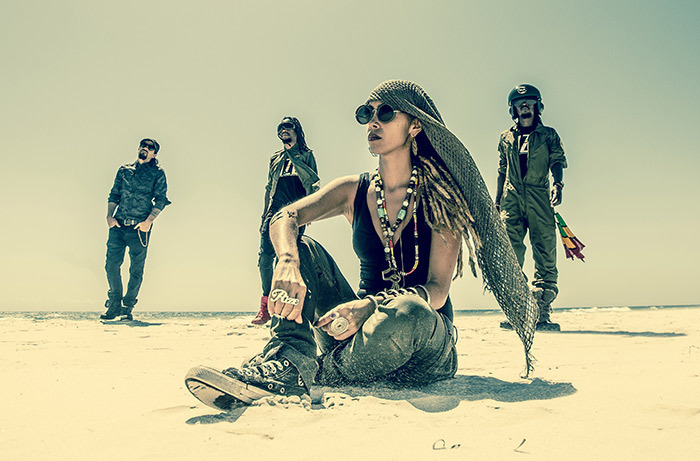 On tour, the Nattali Rize project combines the rebel artist herself as well as her band Yello on drums, Sparrow on bass, Steven Maxwell on keyboards and Carlo "One Rebel" Santone on guitar. Make sure you catch these vibes! Where do I catch you? I'm in Kingston right now. We're kind of just taking some chill time. We are only here for a week because we just came back from shows in New Zealand and Australia, so we have like the week in between before we come to Europe. We'll leave for Europe in the next days. Really just a quick stop-in. Obviously, the release of the album happened two nights ago, so it was great to be here for that. You know, the bulk of the project has kind of been created out of Kingston, so it was really great to be here with all of the musicians and the crew who've been involved in the project and have supported it. Did you have a release party? Well, we just had an informal gathering, which was perfect. Just the crew… a really nice night, good vibes! Are you based in Jamaica by now or do you still live in Australia? I've been based here for a while, but now I'm like just in between, you know, on the road. Especially the last twelve months have been more time on the road than anywhere else, and then, when we do stop it's either here in Kingston or in Australia. You said the album has been done in Kingston mostly. Can you tell us more about the creation process? When I first moved to Kingston in 2014, I started the project with Notis. So the Nattali Rize and Notis project was really my first time moving out of Australia and relocating everything, my life in another place, and that place is Kingston. For me to be surrounded by such epic volume of creative content and creative output by all of the artists here, not just musicians, all the crafts people too… it's a very creative place, as you know, and the community of Roots people here is really strong and really supportive, and I love that. As well as the incredible talent like, you know, I'm a real fan of especially the conscious music that's so prolific out of this part of the world. So, you know, I've been building connections and meeting so many artists through working with Notis, obviously they've been doing their thing for many years here, so it was a great. They are like my family, they introduced me to the scene and embraced me and shared so much, and from that we've been building. Also the musicians who are on the album, Notis played on most of the album tracks. The riddims and songs that have been recorded, some of them are more like from 2014, 2015, and some are from 2016, and the next ones were finished early this year. So, yeah, the album really spans across three years… the songs come from a collection from the last few years of being in Jamaica, I guess, and then a handful of new ones as well, which we kind of self-produced ourselves. How did you link up with the label Baco Records? I think the Nattali Rize management team around Bryan, he really believes in this project and he is the man who looks out for the right connections to help further the movement. He had met Baco Records at one of the industry gatherings in Europe, I'm not sure which, but he met up with them and told them about us and, you know, it just sparked a conversation and we ended up deciding to collaborate and going on this project together as far as Europe is concerned. And even more recently, we kind want them to be a part of our US movements as well, because we really love them and it's proven to be a great relationship. We love the way they work, the energy, the creativity, the vision, anything. We feel really solid and taken care of as far as Europe is concerned. My initial connection would have been through Notis, coming into Kingston. That's how people got to know who I was. And then, I mean, we had mutual friends and… you know how the community is here, like everyone knows someone, so it was just more of thinking of the right voices and the right energy for the songs in particular, so that was just a natural thing. I would think of who would be able to bring some substantial power to the songs as far as vocal tone and lyrical ability and consciousness, and all the guests just reached out, and we had a connection, so… it just worked out! When did you shoot the video for Natty Rides Again with Julian Marley? We shot that… I think it was end of 2015, that was one of the first songs that came out. It was great fun! Actually, we went to just shoot some photos, we wanted to get a couple of shots for the artwork of the single, but we ended up just singing and vibing and doing the whole video in that day, so… It was crazy, it was really good, I really loved Juju's energy, he is extremely talented, a good songwriter, and recording that song together was just a whole heap of fun. Which other songs will be out on video? I know there is One People already, but which others you plan to put on video? As many as we can! (laughs) I definitely want to do one for Evolutionary with Dre Island and Jah9, that must happen. We already started one for Fly Away with Raging Fyah, so that's in the works. Also, Rebel Frequency is in the works, that's already been filmed and everything, so… nuff more coming up! Can you give us some insight as to the title of the album, Rebel Frequency? Sure! You know in this current world paradigm that we are living in, anything that sings out or speaks out or even thinks outside of the very narrow parameters that are set by the systems that we live under, anything that challenges these things is a rebel. In these days, it might be something as simple as growing your own food, because there's a whole heap of, you know, corporate interference with the ownership of food and crops and seeds and genetically modified stuff and all this, so simple things in these day and age are helping. What's happening is that for us, the music is a way of really connecting ourselves to higher consciousness and to that ovastanding of a global family, not just of humans, but of all beings that we share this planet with. And to be thinking beyond the confines of mental slavery and to be thinking beyond these borders and limitations out into a universe of possibility, these things, for our music to be doing that in these paradigms, I'm a rebel! So they are Rebel Frequencies. If you can put it in a few words, what would your vision be of a society or community you would like to live in? What would it look like? For me, it looks like it is about sovereign communities, and I mean communities who take back their power and control in terms of their ability to live and grow their own food, to teach and learn from each other, to be self sufficient, self powered and inspired by each other to grow. Where television and mass media are constantly perpetuating these idea of competition and division and ego and capitalism and consumerism, instead of those things you have communities rooted in fundamental aspects of being a living being and everything spiritually related to that, which is in so many levels and dimensions and possibilities that we have as human beings. Those things I would love to see embraced in a community that ovastands things, and does what's right for them, because geographically things are different for all of us. Depending on where you live, you have a different environment, so there are different circumstances, so one system can't serve all the diversity on this planet. It's really about each community gaining back their sovereignty and power and making their own decisions for their future, with that real essence and understanding and feeling of One Love and a truly connected family across the globe. Then these things can exist and, for me, it's about freedom, like THAT is freedom, it's full freedom without limitation, our ability to just learn and grow and not be limited by what the system says is the maximum of what you can learn and grow to. Whenever I'm in Jamaica, I think that this is something the Rasta communities came quite close to, that might serve as an example for others. There are communities that exist already in parts of the world, that are building and growing their own food, teaching their children and setting up their own schools and so on, you know, connecting in those ways. And, as you say, when you come to Jamaica and see the real sense of community, it inspires you, you know. When we met in Kingston last year, you held a speech at the Nanook, talking about the situation in West Papua. Are there any news, any developments? Yes, the Free West Papua Movement is still going strong. I guess in the past twelve months I haven't been in Australia that much with the crew, we acted more as a supportive online presence for them. Something really significant did happen that we are really proud to be a part of in a really supportive way, and that is a brand new song and single and video that came out, called Sorong Samarai (watch the video here). Sorong is the tip of West Papua and Samarai is the tip of Papua New Guinea, so it's one island and there is the colonial line in the middle that separates West Papua from Papua New Guinea. Papua New Guinea is independent and West Papua is occupied by Indonesia. But really they are one people, it's one island, the same culture, you know, the Melanesian culture, they are one people. So basically, this campaign is to remind the people in West Papua and Papua New Guinea that they are indeed one people and even people in Papua New Guinea don't know the extent of the struggle in West Papua which is just over the borderline. 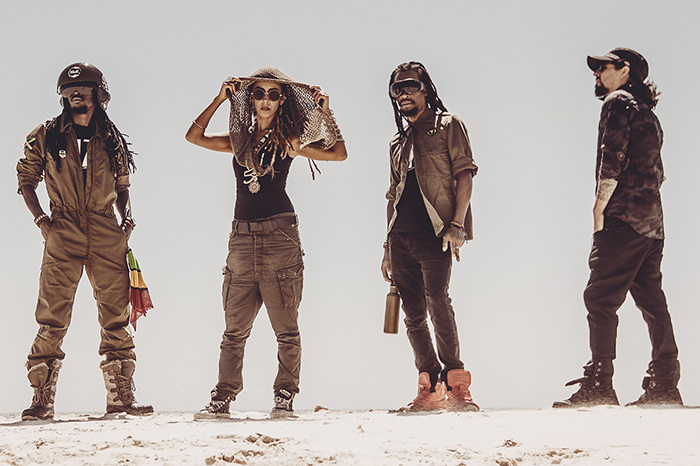 The video was made by a good friend of mine called Airileke featuring Twin Tribe who is from Papua New Guinea, and also Carlo "One Rebel" who is with Nattali Rize, guitarist and management, he filmed it and edited it. This video is part of a bigger video piece, but this particular footage and song is just so powerful, it's the best video clip I've ever seen in my whole life! It's incredible, just a pure insight into an amazing culture and richness and beauty of this island, where it has this complete incredible scenery and people and on the other end there is this incredible violence and torture and oppression. So, the movement, it grows and gets stronger with things like this, and because of the video there was a great piece taking it up on prime time television in Australia, it got to the newspapers, it really kicked up a whole bunch of media which is like first time. Very rarely do they speak about it on prime time, like hardly ever, and they did a really amazing piece on it because of this video. Now you are obviously busy preparing the tour… you just came off an US leg, right? We just did a big US tour with Raging Fyah and Tribal Seeds, and then we went straight into WOMADelaide in New Zealand, and now we are about to head over to your part of the world! I saw some videos about WOMAD, it seems like a big festival. WOMAD is a world music festival, they call it the world's party, and it literally brings together some of the most incredible musicians from all around the planet. We had everyone represented in there, from Asia, Africa, India, South America, it's like the cream of the crop of the musicians of those parts of the world. For us it's a joy because it's so culturally diverse and the location is incredible, it's in botanical gardens and it's just a great vibe. It's been full! Yes, all of your shows should be full so people can listen to your lyrics and messages! (laughs) Everywhere we've been to, it's been an amazing response from the crowd, from American clubs to festivals in New Zealand, people are really really actually listening with open hearts and really feeling, I believe more than ever, the message in the music and the things we say in between. People are really connecting with that on a deeper level than I've experienced in the past, so it's really heart-warming to see that. We are all looking forward to have you over here soon! Thank you so much for the interview.